Everyone at Patty Peck Honda loves the Honda Accord, including the 2016 Accord Coupe! For the 2016 model year, the Accord Coupe features a sporty, redesigned exterior and a brand new line-topping Touring trim! Our Honda dealer serving Jackson invites you to learn more about and explore this impressive model today. 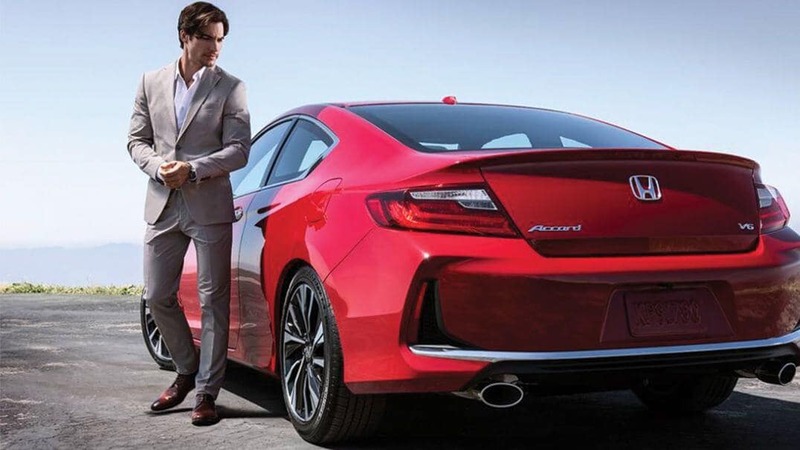 The Honda Accord Coupe surpasses all of the rest as it returns with new features and enhancements. This 2.4L, 16 valve, Earth Dreams® DOHC i­-VTEC® has direct ­injection technology which will result in the most efficient use possible. You’ll race ahead of the pack with 278-horsepower and the available 6-speed Automatic Transmission. All the while remaining fuel-efficient with the Eco Assist™ and ECON button. Sporting an even bolder and sleeker style, this model shows off its new grille and taillights as it glides down streets and dashes across the highways. You’ll be sure to make a lasting impression as you pull up with the LED fog lights. Jackson Honda drivers will step inside the 2016 Accord Coupe and experience comfort at its finest with leather-trimmed seats and a 10-way power driver’s seat. The spacious cabin will surprise all who lay eyes on this model, as the interior is surprisingly roomy for a coupe. Don’t judge a book by its cover. HondaLink™ will allow you to connect like never before. Access all of your favorite online content on your display screen, without reaching for your phone. You can reach your personal music, information, social media, and more with this capability system. Honda LaneWatch™ will further enhance your view of passenger-­side traffic. USB audio interface, the engine start/stop button, the one-­touch power moonroof, and many more features are available to make the Honda Accord Coupe the perfect vehicle for you. Jackson Honda drivers can enjoy this Accord Coupe as it is as safe as it is stylish. With an wide array of safety features, you don’t have to cower behind the wheel. The dual-­stage multiple­-threshold front airbags, SmartVent® front side airbags, and side curtain airbags will help reduce the likelihood of head and upper body injuries during collisions. Every Accord, Coupe or not, features a standard rearview camera to ensure that moving in reverse is an easy task. Add in the Road Departure Mitigation System, Forward Collision Warning, and Collision Mitigation Braking System™ and you have a ride that has you covered from every angle. For more information about the 2016 Honda Accord Coupe, contact us at our Honda dealership serving Jackson today by calling (601) 957-3400 to schedule a test drive. Gas Mileage Est: 23 city/34 highway/27 combined mpg rating for 6MT models. 26 city/35 highway/30 combined mpg rating for CVT models. 18 city/28 highway/22 combined mpg rating for 6MT V-6 model. 21 city/32 highway/25 combined mpg rating for 6AT V-6 models. Based on 2016 EPA mileage ratings. Use for comparison purposes only. Your mileage will vary depending on how you drive and maintain your vehicle, driving conditions and other factors.